^ Müller 1999, p. 92. ^ 10.0 10.1 Lee 2000, p. 40. ^ Müller 1999, pp. 117–118. ^ Müller 1999, pp. 119–120. ^ Müller 1999, p. 153. ^ Müller 1999, p. 203. ^ Frank 1995, p. 63. ^ Müller 1999, p. 204. ^ Müller 1999, p. 194. ^ Barnauw，David and Gerrold van der Stroom. Who Betrayed Anne Frank? (PDF). 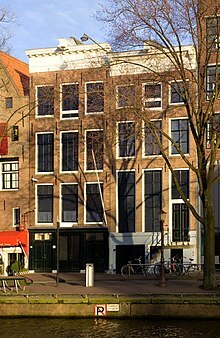 Netherlands Institute for War Documentation，Amsterdam. 2003-04-25 [2007-11-12]. （原始内容 (PDF)存档于2010-03-31）. ^ Müller 1999, p. 233. ^ Müller 1999, p. 291. ^ Müller 1999, p. 279. ^ Müller 1999, pp. 246–247. ^ Müller 1999, pp. 248–251. ^ 48.0 48.1 Müller 1999, p. 252. ^ Müller 1999, p. 255. ^ Müller 1999, p. 261. ^ Lee 2000, p. 216. ^ Frank 1995, p. 242. ^ Romein，Jan. The publication of the diary: reproduction of Jan Romein's Het Parool article Kinderstem. 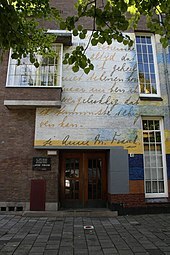 Anne Frank Huis. [2007-11-25]. （原始内容存档于2007-04-29）. ^ Lee 2000, p. 223. ^ Lee 2000, p. 225. ^ Müller 1999, p. 276. ^ 65.0 65.1 Frank 1989, p. 102. ^ Blumenthal，Ralph. Five precious pages renew wrangling over Anne Frank. New York Times. 1998-09-10 [2007-11-25]. ^ Berryman 2000, p. 78. ^ Rosow 1996, p. 156. ^ 73.0 73.1 73.2 Westra et al. 2004, p. 242. ^ Müller 1999, p. 305. ^ Lee 2000, pp. 222–33. ^ 80.0 80.1 Rosenblatt 1999. ^ Frank & Holmer 2005, p. 340. ^ 82.0 82.1 82.2 82.3 Stichting, "Authenticity of the Diary". ^ 83.0 83.1 Lee 2000, pp. 241–246. ^ Prose 2009, pp. 240–249. ^ Lee 2000, p. 233. ^ 94.0 94.1 Thomasson & Balmforth 2008. Barnouw, David; Van Der Stroom, Gerrold (编). The Diary of Anne Frank: The Revised Critical Edition. New York: Doubleday. 2003. ISBN 0-385-50847-6. Berryman, John. The Development of Anne Frank. (编) Enzer, Hyman Aaron; Solotaroff-Enzer, Sandra. Anne Frank: Reflections on her life and legacy. Urbana: University of Illinois Press. 2000 . ISBN 978-0-252-06823-2. Bigsby, Christopher. Remembering and Imagining the Holocaust: The Chain of Memory. New York: Cambridge University Press. 2006. ISBN 978-0-521-86934-8. Enzer, Hyman Aaron; Solotaroff-Enzer, Sandra (编). Anne Frank: Reflections on Her Life and Legacy. Urbana: University of Illinois Press. 20 December 1999. ISBN 978-0-252-06823-2. Frank, Anne. Frank, Otto H.; Pressler, Mirjam, 编. Het Achterhuis [The Diary of a Young Girl – The Definitive Edition]. Massotty, Susan (translation). Doubleday. 1995 . ISBN 0-553-29698-1 （荷兰语）. ; This edition, a new translation, includes material excluded from the earlier edition. Frank, Anne. The Diary of Anne Frank, The Critical Edition. Netherlands State Institute for War Documentation. New York: Doubleday. 1989. ISBN 978-0-385-24023-9. Frank, Anne; Holmer, Per. Anne Franks dagbok : den oavkortade originalutgåvan : anteckningar från gömstället 12 juni 1942 – 1 augusti 1944 [Anne Frank's Diary: The Unabridged Original Edition: Notes From the Hiding Place]. Stockholm: Norstedt. 2005. ISBN 978-91-1-301402-9 （瑞典语）. Lee, Carol Ann. The Biography of Anne Frank – Roses from the Earth. London: Viking Press. 2000. ISBN 978-0-7089-9174-9. Müller, Melissa. Anne Frank: The Biography. New York: Henry Holt and Company. 2013 . ISBN 978-0-8050-8731-4 （德语）. Prose, Francine. Anne Frank: The Book, the Life, the Afterlife. New York: HarperCollins. 2009. ISBN 978-0-06-143079-4. Rosow, La Vergne. Light 'n Lively Reads for ESL, Adult, and Teen Readers: A Thematic Bibliography. Englewood, Colo: Libraries Unlimited. 1996: 156. ISBN 978-1-56308-365-5. Schloss, Eva. After Auschwitz: A Story of Heartbreak and Survival by the Stepsister of Anne Frank. London: Hodder & Stoughton. 2013. ISBN 978-1-4447-6068-2.
van der Rol, Ruud; Verhoeven, Rian. Anne Frank – Beyond the Diary – A Photographic Remembrance. Langham, Tony & Peters, Plym (translation). New York: Puffin. 1995. ISBN 978-0-14-036926-7. Westra, Hans; Metselaar, Menno; Van Der Rol, Ruud; Stam, Dineke. Inside Anne Frank's House: An Illustrated Journey Through Anne's World. Woodstock: Overlook Duckworth. 2004. ISBN 978-1-58567-628-6. 2003 Annual Report. Anne Frank Fonds. 1 July 2004 [18 April 2012]. Biography – Anne Frank. Anne Frank Fonds. [19 June 2013]. Bennett-Smith, Meredith. Anne Frank's Diary Too 'Pornographic' For 7th-Grade Students, Claims Michigan Parent. Huffington Post. 29 April 2013 [3 May 2013]. Blumenthal, Ralph. Five precious pages renew wrangling over Anne Frank. The New York Times. 10 September 1998 [17 April 2012]. Boretz, Carrie. Anne Frank's Diary, Unabridged. New York Times. 10 March 1995 [3 May 2013]. James Whitbourn: Annelies. Chester and Novello. [6 April 2012]. Clinton, Hillary. Remarks by the First Lady, Elie Wiesel Humanitarian Awards, New York City. Clinton4.nara.gov. 14 April 1994 [17 April 2012]. （原始内容存档于2011-05-07）. Faurisson, Robert. The Diary of Anne Frank: is it genuine? 19 (6). Journal of Historical Review. November–December 2000 [18 April 2012]. Feldman, Ellen. Anne Frank in America. American Heritage. February–March 2005, 56 (1) [19 April 2012]. Ferguson, Kate Katharina. Madame Tussauds Unveils Anne Frank Wax Figure. Der Spiegel (Berlin). 9 March 2012 [18 April 2012]. Gabbatt, Adam. Holocaust Film footage of Anne Frank posted on YouTube. The Guardian (London). 2 October 2009 [6 April 2012]. Graver, Lawrence. One Voice Speaks for Six Million: The uses and abuses of Anne Frank's diary. Yale Holocaust Encyclopedia. Yale University Press. [17 April 2012]. Welcome to the Anne Frank educational centre. 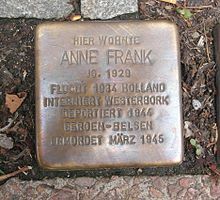 Jugendbegegnungsstätte Anne Frank. 2012 [12 September 2012]. Kreijger, Gilbert. Dutch court saves Anne Frank tree from the chop. Reuters. 20 November 2007 [6 April 2012]. Laeredt, Angela. Anne Frank: After the diary stopped. The Independent (London). 5 May 1995 [18 April 2012]. Levin, Meyer. The Child Behind the Secret Door; An Adolescent Girl's Own Story of How She Hid for Two Years During the Nazi Terror. The New York Times Book Review. 15 June 1952 [17 April 2012]. Marcuse, Harold. Lessons from The Diary of Anne Frank. history.ucsb.edu. University of California, Santa Barbara. 7 August 2002 [17 April 2012]. Max, Arthur. Anne Frank's Cousin Donates Family Files. The Washington Post. Associated Press. 25 June 2007 [18 April 2012]. McCrum, Robert. Anne Frank: was her diary intended as a work of art?. The Guardian (London). 1 August 2010 [6 April 2012]. Michaelsen, Jacob B. Remembering Anne Frank. Judaism: A Quarterly Journal of Jewish Life and Thought. Spring 1997, 46 (2) [17 April 2006] –通过Questia. Nothospital. 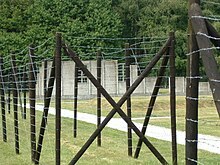 Gedenkstätten Bergen-Belsen. Stiftung Niedersächsische Gedenkstätten. [23 July 2013]. （原始内容存档于2013年3月27日） （德语）. O'Toole, Emer. Anne Frank's diary isn't pornographic – it just reveals an uncomfortable truth. The Guardian. 2 May 2013 [3 May 2013]. Anne Frank Tree Blown Down. Radio Netherlands. 23 August 2010 [17 April 2012]. Rosenblatt, Roger. The Diarist Anne Frank. Time. 14 June 1999 [17 April 2012]. Stevens, Mary. 2 videos recollect life in World War II. Chicago Tribune. 1 September 1989 [6 April 2012]. Thomasson, Emma; Balmforth, Richard. 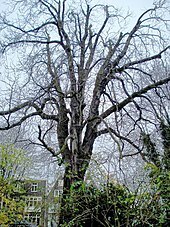 Plan agreed to save Anne Frank tree from the axe. Reuters. 23 January 2008 [17 April 2012]. 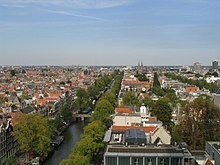 Holocaust Encyclopedia – The Netherlands. The United States Holocaust Memorial Museum. [17 April 2012].